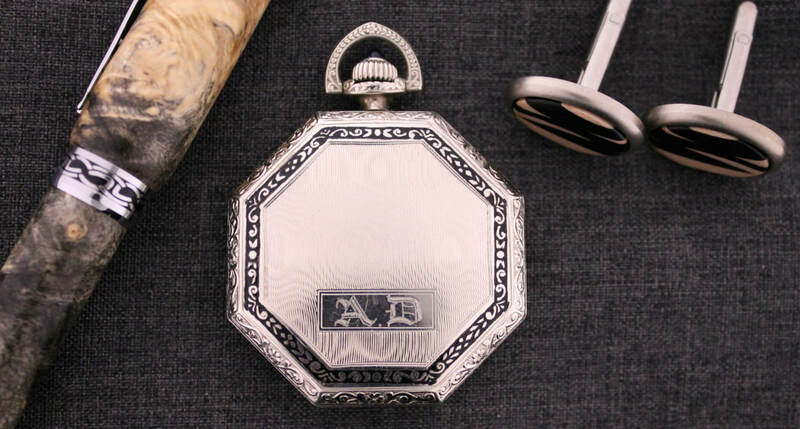 Adam's Deco Pocket Watch with Deco Era Initials | Took a long time to find it! AdamVintage curates the best examples with a focus on rare vintage watches and military watches. Provenance, condition and originality are all top priorities. We also seek out the best hand craftsmanship in the USA and sell personal or gift Items that are modern, meaning new. Adam J. Dubilo, our founder, is an American and Western European antiquities expert; therefore, we carry vintage and antique items focussing on things that have fun stories behind them, and are often rare. Office and vintage gift boutique at 145 Shaker Road, East Longmeadow, MA 01028. Please look through our contact us page to see hours and more. Adam J Dubilo is the founder of AdamVintage. Since a very early age, Adam has been fascinated with both the craftsmanship and mechanics of fine watches. In fact, it was at the age of 12 when Adam purchased his first fine mechanical watch. It was an antique American Made Waltham Railroad Grade pocket watch purchased with his paper route money from the local coin shop. "I took it apart, one gear, one screw at a time - then I put it back together. I even managed to get that watch working. It was at that moment when I knew there was no turning back - I was hooked." For many years, Adam has been a vintage watch enthusiast and dealer when he founded AdamVintage in the fall of 2010. AdamVintage is a premium destination for fine Swiss, American, German and Japanese vintage watches, antique American and Swiss pocket watches, finely hand-crafted watch accessories and new Hadley-Roma Watch Straps. Our goals are simple. We seek to source and sell the best examples of fine Swiss, American, German and Japanese wrist watches available at reasonable price points. We have a passion for watches and our second goal is to share that passion through education by finding and sharing valuable content about watches through social media, our learn page, our blog and our sister site Vintage Watch Blog. Finally, our third goal is to influence Men's and Women's fashion through the promotion of vintage watches as a unique high-end accessory. AdamVintage is an international firm and we do business worldwide. Most of our business is done domestically here in the USA. Adam lives in New England with his beautiful wife Jennifer and two fantastic kids. To learn more about Adam, visit adamdubilo.com or his linkedin profile which is a great resource to learn about Adam's professional background. Why Choose AdamVintage.com for your Vintage Watch Purchase? Here's Fred, our master watch technician hard at work. Unless you've never yet ventured into vintage watches, you may already know that the vintage watch market can be difficult to navigate through and has many dealers and auction sites both good and bad. Let's talk about the bad guys for a moment. These dealers will say just about anything to sell you their watches, will often have a final sale policy and sometimes will not accept credit card or electronic payments in fear of charge-backs. 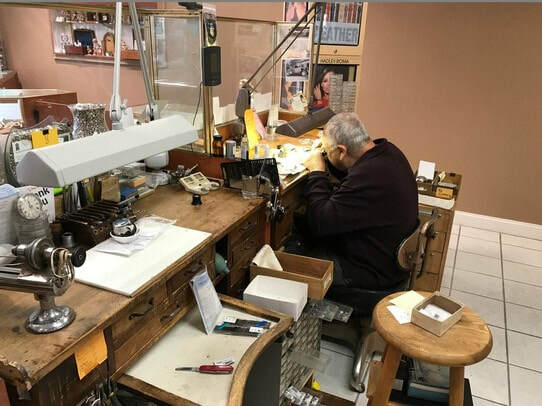 Yes, these are the guys that tell you a watch was just overhauled and is working perfectly, when they know it does not even run; or that a watch is original when in fact it's a bunch of pieces put together that don't belong together. There are sites out there that just downright sell counterfeit watches. Even John Mayer, the singer song writer, that is a well known collector, got duped in recent years. There is nothing more disappointing than receiving a watch that is described as working well, and arrives not working at all. In fact, in the past few years, I have not had even one instance of this happening with a watch purchased from AdamVintage; however, it can and does happen, and it doesn't necessarily mean your dealer is a bad guy. I've been on the buying end of a watch that arrived not working, many time, and I know what that feeling is like. Vintage watches can be delicate and therefore damaged during shipping. That's why we take extra precautions with our shipments. First, every watch is double bubble wrapped with no room to freely move around. All shipments with values over $500 are always double boxed with the inside box containing a second set of tracking instructions. All shipments over $500 require a signature confirmation. And all shipments are insured for both parties protection. At AdamVintage, we do not sell counterfeit watches or watches that have been pieced together that never really existed. Instead, we focus on high quality pieces that have been professionally curated by Adam at a variety of price points. Please note, we only deal in mechanical watches - you will not find a watch that needs a battery here. All watches on this site have all their major parts being original to the watch unless noted in the description. Minor parts that may have been replaced through the years, such as a crystal or crown which is common and usually does not affect value. Each watch is inspected by our watchmaker at the time of intake and overhauled (meaning a full service) if necessary. Prior to shipping, each watch is examined to make sure nothing has changed with the watch, that it is regulated within +/- 60 seconds per day and tested on a time-o-graph. This ensures a high likelihood that your watch will arrive working as described. During shipping, your shipment passes through many harsh magnetic field which may magnetize your watch. This is the most common diagnosis for poor timekeeping. If you are a collector or intend to, invest in a demagnetizer; they are very inexpensive. We will take all the precautions to protect your purchase. But what makes a dealer great is their passion for the business, their willingness to take ownership of a problem, their knowledge, and most of all their respect for the art of watchmaking. I can assure you, I embrace all. With that said, I hope you enjoy navigating through our site and we hope you find the piece you are looking for within your budget. If I can be of assistance to answer questions or simply help you pick out the correct piece; please do not hesitate to call me directly at 413.893.4476. Calls are automatically screened to avoid telemarketers, so you will be asked your name when you call. If I cannot pick-up, I will promptly return your call if you leave a message. Please note, I do not do appraisals over the phone; nor can I answers specific questions about a watch you have without inspecting it in person.